Self-seeding plants can be a blessing or a curse. Those I put in the latter category are usually considered weeds (and we have several varieties of them! ), but those that I’m happy to see are “useful”. The latest round of roselle plants – all of them self-seeded. 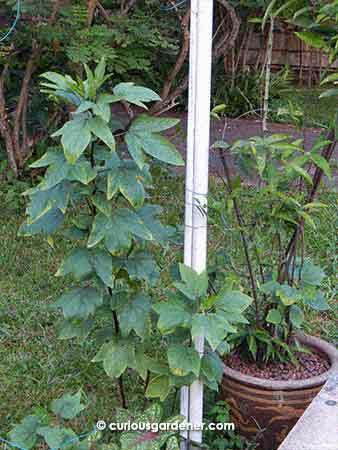 Take our roselle plants for example. I started growing them from cuttings given by another gardener way back in 2010. From there, I harvested seeds, and grew more plants. In time, though, I grew more callous towards the plants, and wasn’t as attentive about collecting seeds or harvesting fruits. In fact, a few of the plants eventually died off with the dried fruits still on them, and seeds escaped from the dried pods. allowing new plants to spring up on their own. This has been a blessing in disguise, because it’s been some time since I last saved seeds from the roselle plant, and I doubt they are still viable. I guess this spot is now designated for these plants, since they keep growing here. Two types of alder flowers here – sulphur alder on the left, and yellow alders on the right. The alder flower family seems to love the conditions in our garden. Or perhaps they are not fussy flowers. We bought the sulphur alder flowers and got the yellow alder flowers from cuttings from my sister’s garden. I can tell you that these plants disperse their seeds very effectively – the sulphur alders were in a patch in one area, and the yellow ones in another. Yet, over time, they have met and merged and spread to all areas of the garden. I only consider them a nuisance if they interfere with other, favoured, plants. However, it’s visually appealing to see them sharing space with some of the other plants. They’d better keep propagating themselves because I haven’t done anything to keep them around. 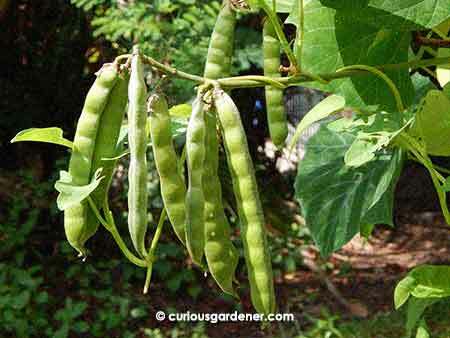 What a lovely cluster of bean pods – if only they were edible! Jicama seed pods. 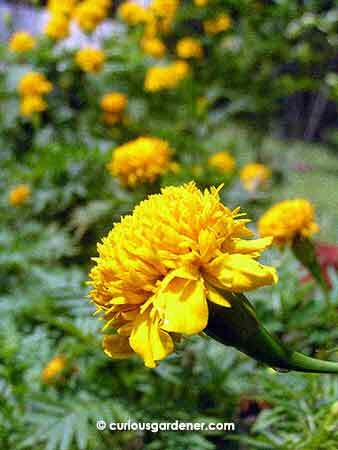 We had bushes of marigold plants at one point, but they stopped growing in that spot, and my saved seeds lost their viability. I have to start from new seeds again (in progress). 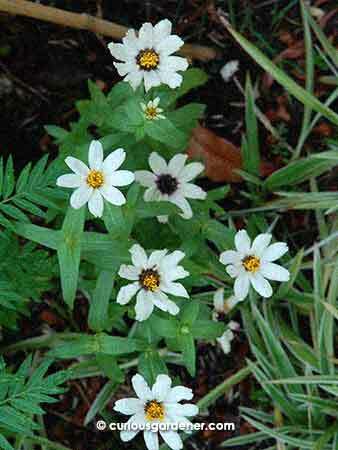 We also used to have zinnia plants at one point. The white ones flowered more profusely than the red ones, and were really pretty in a cluster. I need to source for seeds again, if I want to grow them again. 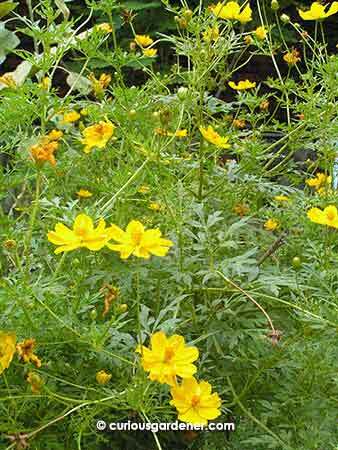 Yellow cosmos plants add such a splash of colour! Ah, I miss these flowers! However, I’ve learned from experience and from the wisdom of other gardeners that you should focus on growing the things that grow well in your garden. Goodness knows that I’ve experimented with different plants over time and worked hard to keep them happy. 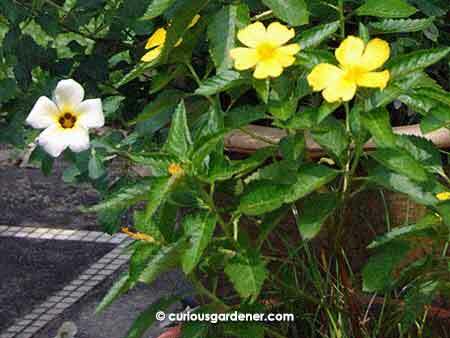 It would be better to choose plants that are more fuss-free and suited to the conditions here. Right? © 2014 curiousgardener.com All rights reserved.